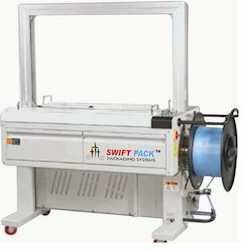 Pioneers in the industry, we offer semi automatic strapping machine, heavy duty strapping machine, table top strapping machine, electrical strapping machine, strapping machine and automatic strapping machine from India. Semi Automatic Strapping Machine Deluxe Model 740 is suitable for cartons, calcium-plastic cases, books, soft and hard packages as well as all kinds of articles in the square, cylinder or annulations. The machine with the high table is suitable for general objects, while that with the table in middle height is suitable for those packages that are larger or heavier. 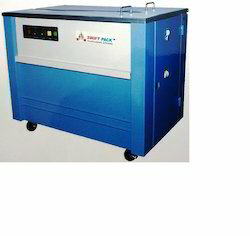 SP740 Semiautomatic strapping machine is widely used in various fields such as light industry, foodstuffs, foreign trade, printing, medicine, post etc. 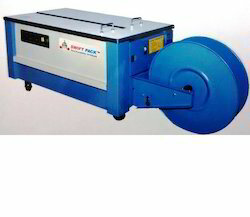 Being a noteworthy enterprise of this industry, we are offering a wide spectrum of Heavy Duty Strapping Machine. We are the leading organization in the industry to provide our clients with the best quality array of Table Top Strapping Machine. 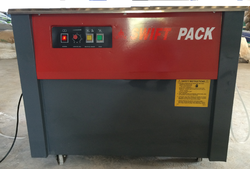 The machine offered with the very low table is suitable for the packages that are very large or heavy. The offered machine is manufactured using premium grade components as well pioneered technology under the strict supervision of adept professionals at vendors’ end. The provided machine is precisely examined by our quality auditors on set parameters of quality to ensure its functionality. Low Table Top Strapping Machine is suitable for cartons, calcium-plastic cases, books, soft and hard packages as well as all kinds of articles in the square, cylinder or annulations. 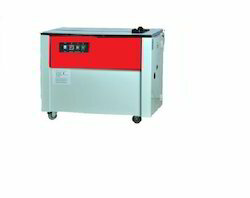 The machine with the very low table is suitable for the packages that are very large or heavy. The machine with the very low table is suitable for the packages that are very large or heavy such as Automobile industries. As a quality driven enterprise, we are engaged in providing a beautiful range of Electrical Strapping Machine. Energy saving mode that activates within 2 min of non-use and allows for instant operation. Excellent quality of timer, solenoid, and other electrical components. This is suitable for general objects. This machine is equipped with rollers to ensure strapping can be achieved with less force. The automatic strapping machine can be used in the production line of which objects differ in size and irregular in shape, and it can achieve unmanned strapping together with power conveyor. Power belt tabletop and access transmission mechanism are adopted, with easy maintenance. This is widely used to strap various packages (except annulations) in all kinds of fields. Strapping Machine is suitable for cartons, calcium-plastic cases, books, soft and hard packages as well as all kinds of articles in square, cylinder or annulations. The machine with the high table is suitable for general objects, while that with the table in middle height is suitable for those packages that are larger or heavier. 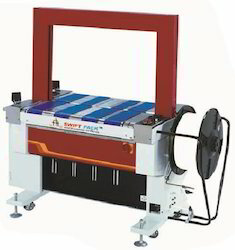 We are the remarkable entity, engaged in offering superior quality Automatic Strapping Machine. 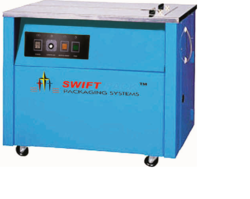 This machine helps in par-excellence and stellar packaging, due to excellent strapping. Looking for Strapping Machine ?